Anna O’Mally is a born writer—gifted, perceptive, headed for the stars. Or she was, until the tragic death of her uncle Joe. He was barely older than Anna herself, and she worshipped the ground he walked on. Best of all, Anna got to live in the glow of knowing that she was the most important person in his world, too. Anna has promised everyone—her shrink, her parents, her best friend—that Joe’s one-year “deadaversary” will be the end of her period of mourning. But when a strange note suggests that her saintly uncle had deep secrets, Anna stumbles into a chain of events that changes everything she thought she knew about the past, the possibilities of love . . . and origami. Anna’s a writer whose left wordless after the death of her beloved young uncle. 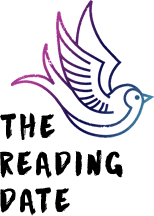 Food, family, friends, Patti Smith and paper cranes help move the healing process along. 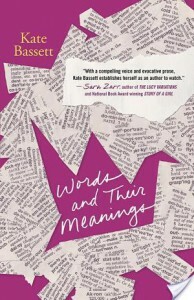 Words and Their Meanings is Kate Bassett’s debut novel and it’s one of the better YA books I’ve read about grieving. I would have read this one straight through except the subject matter is kind of exhausting. Words’ Anna takes you down with her so I was left in kind of a funk myself, recalling my own losses. With Joe’s death, Anna’s once-tight family unit begins to unravel and she’s starting to take it personally. Her parents got divorced, and her grandfather was in an accident- is she somehow responsible? 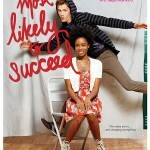 She’s reluctant to let anyone get too close, including Mateo, the young chef who takes an unexpected interest in her. The plot thickens when Anna discovers a mysterious letter in Joe’s room, leading Anna to do some amateur sleuthing. Joe was in a long-term relationship but seeing someone on the sly. Solving the mystery gives Anna something else to fixate on rather than on her own dark clouds. Plus, she ropes her neglected best friend Nat into the Scooby mystery- giving them a chance to get reacquainted. In Words, the romance is something bright and hopeful in Anna’s life, and helps her to see past her own troubles, and to see art as an option again. It’s not the main focus of the book but adds another interesting layer and distraction. Kate Bassett’s writing is sharp and lovely and makes this one an emotional read. And though the story is mournful there are certainly humorous moments that lighten the mood. It’s also kind of a love letter to art and its different mediums, and about following your passion. And foodies take note- this book will make you very hungry! I especially want the recipe for Mateo’s rice, mushroom and kale crepes. 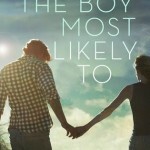 Contemporary YA fans should put Kate Bassett on their radar and hunt down Words and Their Meanings. Recommended for readers who like Love Letters to the Dead and This Song Will Save Your Life, and authors like Sara Zarr and Gayle Forman. This does sound lovely & I’m intrigued to see Bassett’s work. 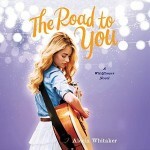 I think it’s an Amy book- hope you check it out! Even though the subject matter is draining, this sounds like a book I’d love. It is draining in the sense that the author gets the “grieving” feeling just right. I think you’d like this one, Kathy. Oh perfect for my friend Wendy’s daughter! She is starting to love reading but she is more into contemporary reads. I am going to put this on her Christmas list! I love that you are reading/reviewing these books because I am overall not a contemporary fan (in adult) so I never see me trying one in YA. However, I am so stoked this kid is finally reading (read FOAS in 2 days) that I am paying close attention to the ones y’all really like 🙂 I will bribe her with books to continue reading! I’m so excited for this one, I’m glad to see you enjoyed it ! I have soooo many books to read over the next couple of months, but I hope to get to this at some point! It sounds beautifully written. Thanks for your review, Lucy!